In 2016, following an New York Times article about the hidden owners purchasing apartments in the Time Warner Center in New York City, the treasury department began identifying and tracking the mysterious buyers of high end properties. Furthermore, in 2017 USA Today reported that around 70% of the buyers of Trump Real Estate used LLCs, compared to just 4% two years prior. In fact, even the Obama family purchased their DC home through an LLC. While the vast majority of home buyers in NYC (let alone across the nation) will neither be purchasing Trump Real Estate nor purchasing through obfuscated shell corporations a la the 2016 NYT article, LLC purchases in NYC are on the rise. 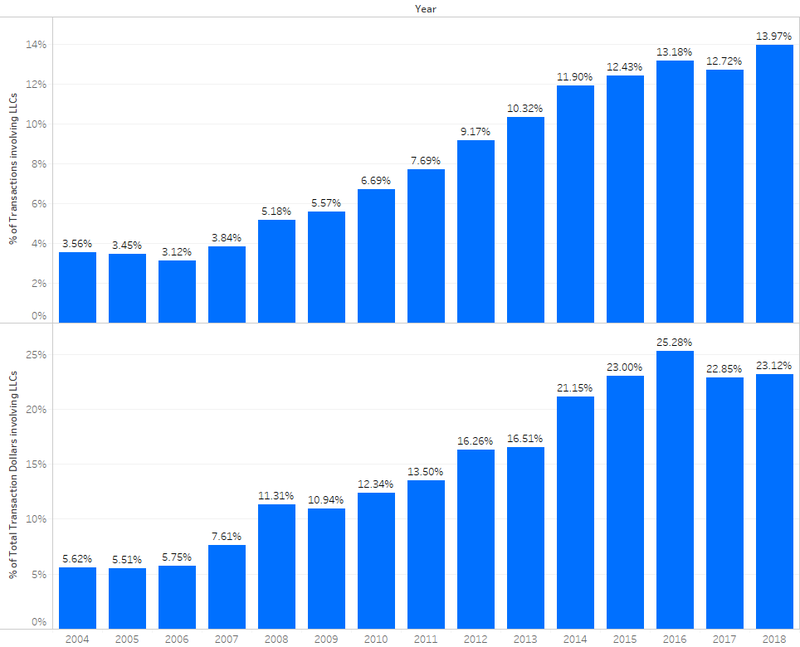 RealtyHop’s data science team has combed through public ACRIS (Automated City Register Information System) data provided by the NYC government  to take a look at the landscape of LLC  residential purchases in NYC and how that’s changed over time since 2004. LLC involvement has increased to nearly 14% of transactions and nearly 25% of the value of residential real estate purchases in the past 15 years. In 2017, the median purchase price for residential properties in Manhattan with LLC involvement was slightly above 2.7x that of the transactions without LLC involvement (Roughly $2,700,000 vs $990,000). 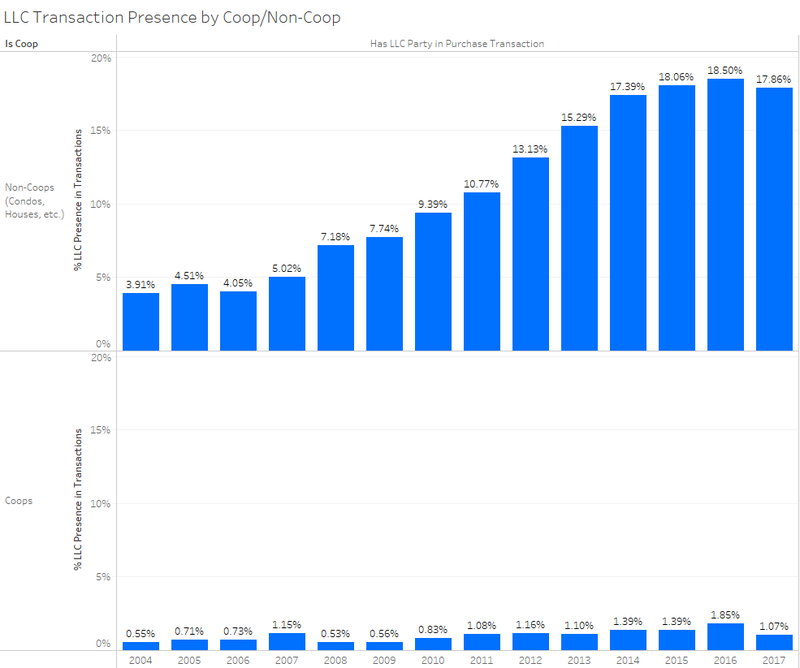 While overall LLC involvement in residential purchases has increased significantly over time, LLC purchases in coops have remained largely flat since 2004, hovering around 1%. 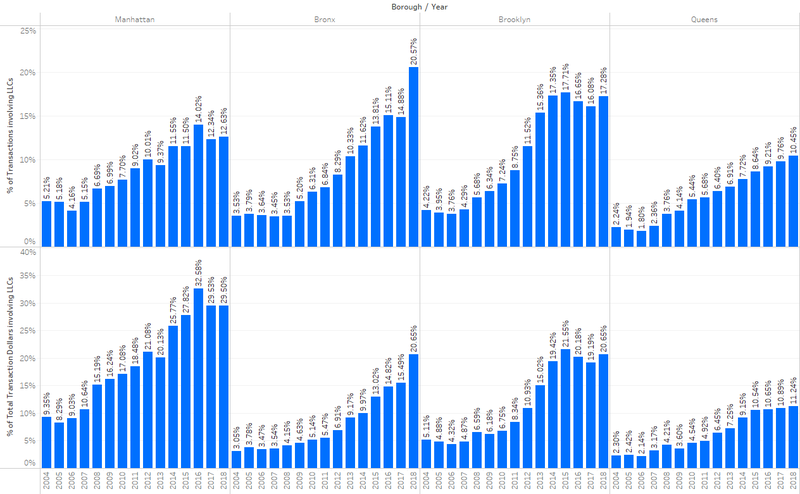 While some years tend to have higher rates of LLC involvement than others on both a transaction count and dollar value basis, the trend is clear: the number of properties in NYC being purchased via LLC has increased significantly since 2004. As you can see above, the trend of LLCs increasing in both purchase count and dollar value exists for all boroughs – not just Manhattan as one might initially assume. That said, while the trend of LLC involvement in residential purchases is clear over time, the degree to which the purchase price differentials between parties involving LLCs vs. those that do not is most stark in Manhattan. With this increase in the number of LLCs involved in residential real estate purchases, we have also taken a look at the median transaction prices and found that the median purchase price of residential buildings has increased significantly over time (with a slight dip following the financial crisis in 2008). 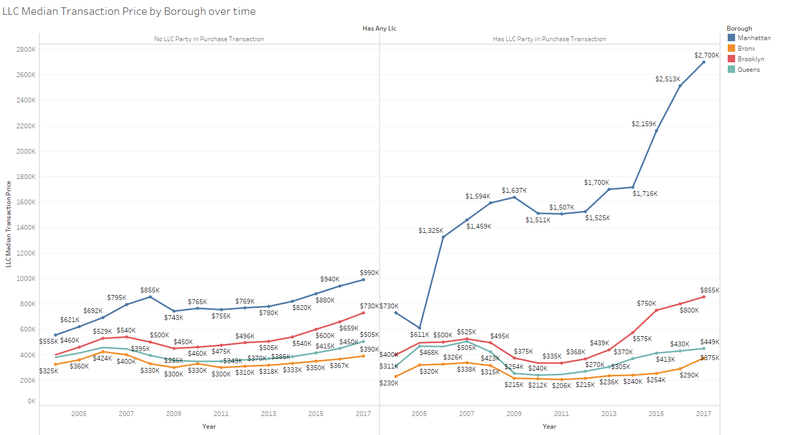 That said, however, when one looks towards Manhattan, one can see the stark difference in the median price increases over time, with a special emphasis on transactions involving an LLC versus those that do not – in 2017, the median purchase price for residential properties with LLC involvement was 2.7x that of the transactions without LLC involvement. Despite this trend of increasing LLC purchases in residential real estate, coop buildings have been largely insulated, which makes intuitive sense given the additional restrictions that coop boards place upon potential buyers. Are you curious about the differences between condos and coops? See our blog post for more details. First and foremost, there’s a wealth of data available to you when it comes to doing your research when purchasing a home in NYC. In addition to the public data we used for the analysis in our study, RealtyHop also surfaces data regarding potential housing purchases – things like the expected maintenance costs, property taxes, mortgage payments, rental income estimates, and cap rates, all thanks to our sister site (RentHop)’s proprietary data. Secondly, we display historical transaction information directly on our site as well, allowing you to get better insight into previous purchases for particular buildings, along with the asking prices for additioanl units for sale in the buidling. We wish the best of luck to you in your search. Data comes from ACRIS. 2018 includes data up to 6/30/2018. LLCs tagged based on the party names associated with transactions in said ACRIS data. We’re only looking at purchases (i.e. the party who buys a property) and not those entities that sell the aforementioned properties.